What’s So Hot About Thermal Imaging? What Makes Infrared Thermography Cool? Thermal Imaging, otherwise known as Infrared Thermography (IRT) is a service we provide free of charge with all of our home inspections – but you’re probably wondering what it is and why it’s so important. Read on to learn more about this remarkable tool and how it will benefit your home inspection! Using a special type of camera, your home inspector can capture wavelengths emitted outside of the spectrum that the unaided human eye can see. This means that we can use this important tool to pinpoint areas of heat loss as well as overly hot elements. What Can An Infrared Scan Do For You? 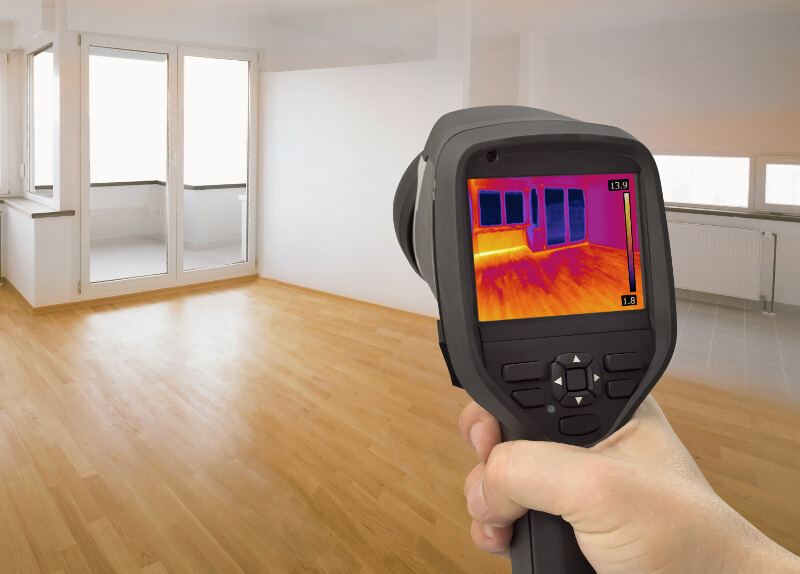 An Infrared Thermographic scan has the potential to save you hundreds– if not thousands–of dollars by revealing abnormal temperatures in your home that might be caused by serious issues such as missing or damaged insulation or overheating electrical circuits. Thermal imaging is especially helpful because your home inspector may identify minor problems before they become catastrophic and costly. By bringing the symptoms to light, anything revealed by a thermographic scan can be diagnosed and dealt with before turning serious and requiring more invasive techniques and money to fix. Since thermal imaging can detect areas of heat and energy loss, an inspection can also help you save on monthly utility bills! What Can Infrared Thermography Detect? Without the use of an Infrared Thermographic camera, many of a home’s defects can go undetected until they get out of hand and cause even more damage along with enormous remediation costs. This is why we offer thermal imaging free of charge with each and every home inspection. Trust that we are on your side! As your home inspector, we want to catch as many visible and accessible defects as possible–including those that only Thermal Imaging may reveal. For more information on the benefits of thermographic inspections, take a look at this article. Oasis Home Inspections, LLC specializes in Wind Mitigation Inspections, 4-Point Inspections, and Thermal Imaging. We serve Melbourne, Florida and the surrounding areas with friendly, professional home inspections.